Marbling, when done well, can look interesting and best of all it’s a really easy technique to achieve. The great thing about marbling is that you will achieve a different effect every time. There are two different ways that you can create the marble effect. The first one is actually before the bisque firing process and when you are making your pot. You’ll need to start with two different clay bodies. Two that work well together are a pale white stoneware and terracotta. Once you’re prepped each of the two different types of clay and made sure there are not any air bubbles, cut them into thin slabs (you can play around with the size and width of the slabs depend on the effect you want to achieve). Then stack the slabs of clay on top of each other, making sure to alternate one stoneware piece than one terracotta piece. Again, at this stage be careful not to get any air bubbles between the layers. The start rolling the clay out very carefully, the effect you will see coming through is beautiful, as when these two clay bodies are rolled together, it can almost look like wood. You can create whatever pot or dish you like with the clay. 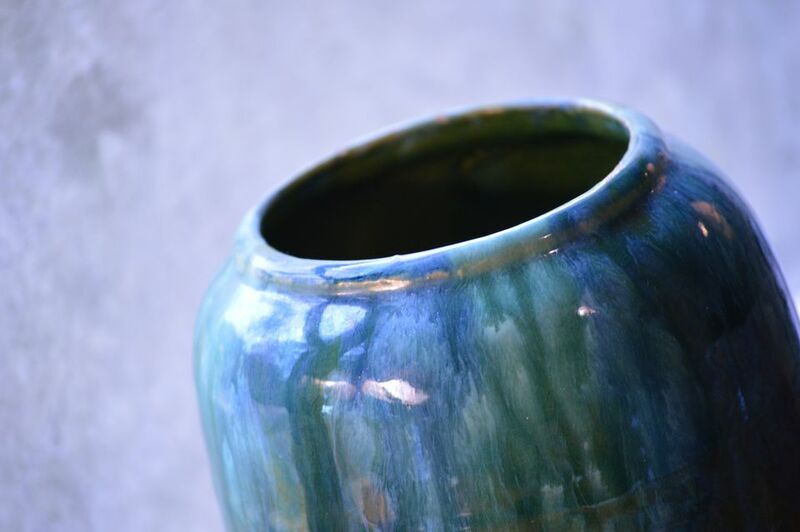 Marbled clay is quite striking, so you will only really need to glaze it with a clear glaze afterward. Marbling with slips can look incredible, and it's a fairly easy technique to master. The beauty of working with slips is that the range of colors you can work with is vast and you have much more flexibility in mixing up your colors than you do with glazes. To start your marbled piece, you’ll need to have your bisque fired clay piece ready and your slips ready. You’ll need one color for the base and a different colored slip in a squeezy bottle with a nozzle for the marble. You can marble on to any shape of pot you like, but for your first time using the marble technique, a medium-to-large dish would perfect. First off you’ll need to cover your work in a full layer of slip and very gently swirl the slip round in the dish. This technique has been given the rather brilliant name of joggling, which means ‘to move or cause to move with repeated small bobs or jerks.’ Once the dish is completely covered, you can gently pour the rest of the slip back into the pot. If you’re looking for an even easier way to marble your clay pieces, then you can try out the technique of marbling with shaving cream. All you need to do is squirt a large amount of regular shaving cream onto a big square of cardboard. Use one of your pottery tools, like a rubber or wooden rib to smooth out the shaving foam. Then drop onto the shaving cream dots of the underglaze or Concepts glaze you would like to use. Using a tool or the end of a paintbrush, then swirl all of the colors together to create your marble effect. Press down your dish into the shaving foam and leave for a few moments to soak in. Scrape off the excess shaving foam and rinse gently under running water. The glazes will remain in a marbled effect on the dish, and it'll be ready for firing.